After over 500 days as NXT Women's Champion, Asuka has vacated the title and could soon be on the WWE main roster. 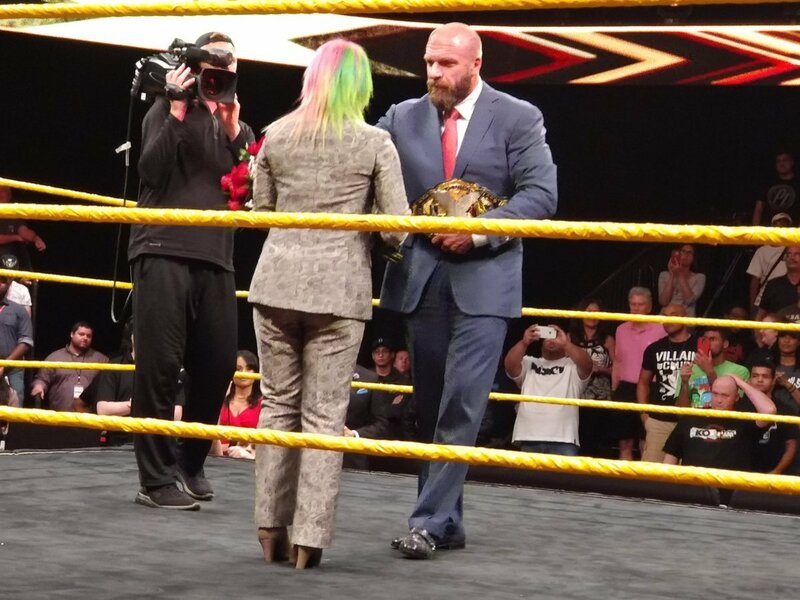 An in-ring segment where she relinquished the championship closed tonight's NXT TV tapings at Full Sail University, with it being noted that William Regal has (in storyline) begun negotiations for her to move up to Raw or SmackDown. The locker room emptied as she departed NXT and Triple H came out to give her a bouquet of flowers and take the title. Asuka capped off her run as NXT Women's Champion by defeating Ember Moon at TakeOver: Brooklyn III last Saturday night. It was reported by WWE that she had suffered a broken collarbone in that match and would be out of action for several weeks. No indication was given at the tapings on how NXT will crown their next Women's Champion or if the Mae Young Classic will have any bearing on that.